Colin( MBA MBCI ) has wide ranging experience were gained in over 30 years of business and in parallel 26 years as a fire officer commanding a busy part time fire station in England, where he managed disasters on almost a daily basis until his retirement from this role in 2006. This has provided him with a unique insight into the importance of Disaster and Business Continuity Management. 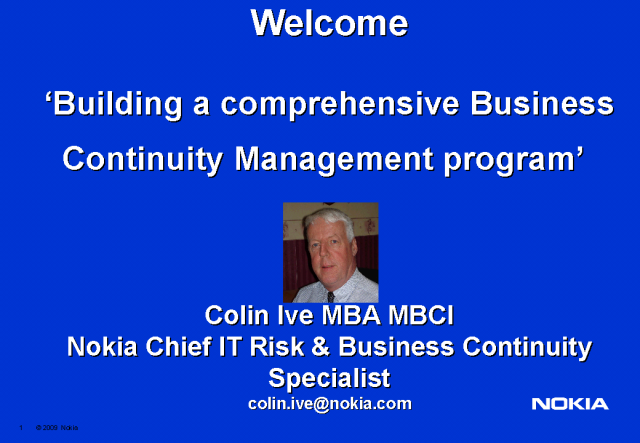 Following the completion of his MBA in 2000 Colin became the Chief IT Risk & Continuity Specialist at Nokia. He has been responsible for all related global Business Continuity Management processes, procedures and documentation. Including a cost effective e-learning program. interest as a life President of the UK Retained Firefighters Union.